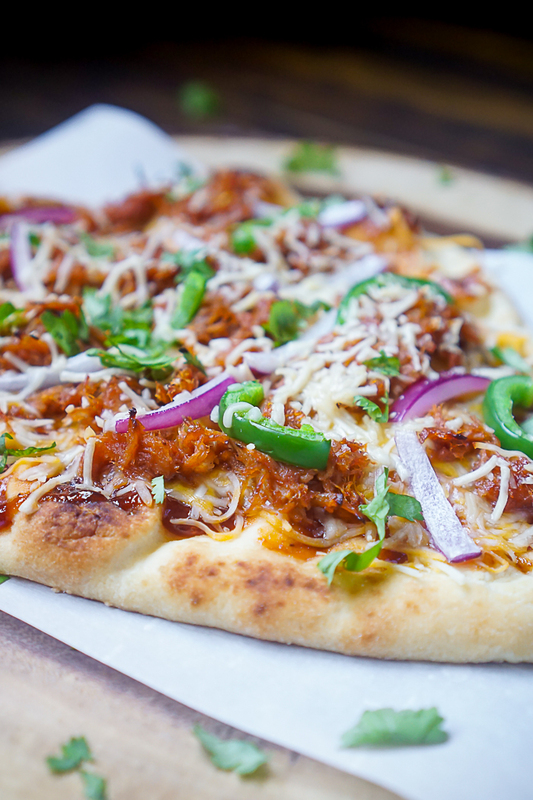 BBQ Pulled Pork Flatbread Pizza is downright addicting! Whether you want to enjoy this recipe for lunch, dinner or with your friends on Game Day, this easy flatbread recipe takes only 15 minutes to cook and always delivers great flavor! 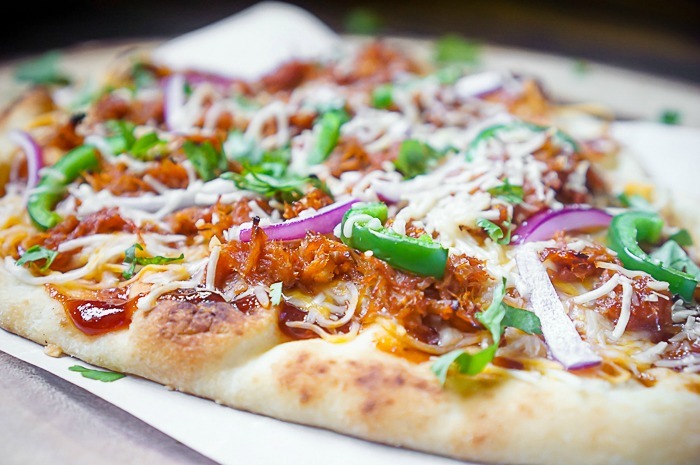 BBQ PULLED PORK FLATBREAD PIZZA IS ALWAYS A CROWD PLEASER! I am a huge fan of flatbread pizzas. While it doesn’t replace ordering a warm deep dish pizza or thick crust pepperoni pizza, flatbread pizzas are a favorite of ours for an easy weeknight dinner and as appetizers when friends are over for game day. We even like it for a fun and easy Saturday afternoon lunch. There are only so many peanut butter and jelly sandwiches I can eat in a week before I want to spruce up lunch and this BBQ Pulled Pork Flatbread Pizza is the perfect way to spruce up Saturday lunch. I honestly think flatbreads are my favorite easy recipe to fall back onto. It’s so easy to use up whatever ingredients are in the fridge and to switch up the flavors. We use everything from bacon, pesto, ranch dressing, cream cheese, ground beef, leftover charcuterie, leftover veggies and more! Start by putting your flatbreads onto your pan of choice. I prefer to use a crisper pan, which is a pan with little holes on the bottom, because it helps to get the flatbread just a little more crispy on the bottom which is my personal preference. Side Note: Crisper pans are one of my favorite kitchen tools to have on hand. We use them for baking chicken tenders, pizza, fries, and more. Anything that you want to have a crunchy outside can go right on the crisper pan. I thought it was a bit of a hoax at first, not thinking the little holes would make much of a difference in the cooking, but it’s not. I especially notice the difference when we cook fries, tater tots and these flatbread pizzas. When ready, spread on your favorite BBQ sauce. We like something that is both sweet and spicy as it pairs well with the pulled pork. Plus we love recipes with a little kick! Add your toppings. For this recipe, I used pulled pork, red onion, deseeded jalapeños, mozzarella cheese and cilantro. I normally start with a heavy layer of cheese and finish with another sprinkle of cheese on top. Bake in the oven for 400 degrees F for around 10 minutes or until flatbread is golden brown and the cheese is melted. WHICH FLATBREADS SHOULD I BUY FOR PIZZA? While there are a lot of choices and options, Stonefire flatbreads are definitely my go-to choice. They are fresh, easy to freeze so they are on hand for a last minute meal time, and quick to cook! If using Stonefire, I follow the directions on the back of the package, spritzing them with water and baking the flatbreads for a few minutes before adding ingredients. It helps make the crust crispier which I like. Many people will see jalapeños on this flatbread recipe and assume it’s not for them. You should definitely give it a try though! I use fresh jalapeños and deseed them, which is where the majority of the heat lies in the pepper. Without the seeds, most jalapeños just provide a subtle heat and the perfect flavor to go along with BBQ sauce. I use my recipe for 4 Ingredient Pulled Pork for the topping of this pizza. I like to make a big batch when I make it specifically for leftover recipes like this one. It’s easy without losing great taste. 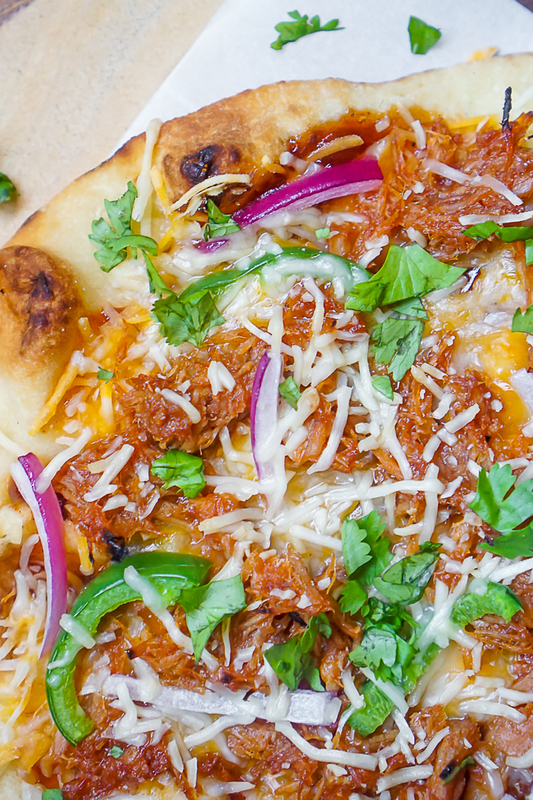 YOU’LL BE ENJOYING THIS BBQ PULLED PORK FLATBREAD PIZZA IN NO TIME! BBQ Pulled Pork Flatbread Pizza is addictively good! Whether you want to enjoy this recipe for lunch, dinner or with your friends on Game Day, this easy flatbread recipe is ready in no time and always delivers great flavor! Place the two flathreads on parchment paper and then spread on desired amount of bbq sauce with a spoon or pastry brush. Top each with cheese, pulled pork, red onion, jalapeños and a little more of the cheese. My recipe for 4 ingredient pulled pork: https://thelovenerds.com/2017/01/4-ingredient-slow-cooker-pulled-pork-recipe.html. Bake in the oven at 425 for 10 minutes, until the cheese is melted and starting to turn golden brown. Remove and let cool before garnishing with cilantro and slicing.